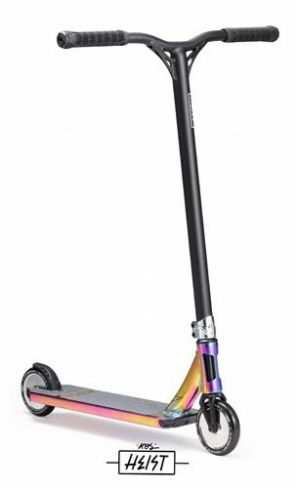 The Heist comes stacked with quality parts: High Grade 7 Series Aluminium Reaper bars, TPR 160mm long Handgrips that are extremely durable and offer the perfect grip for the scooter with Nylon Bar Ends. Two bolt oversized forged clamp with 6mm Bolts. The Classic SOBV3 IHC forks made from the best 6061 Alu fitted with 120mm x 26mm Hollowcore 86A Pu Wheels. The deck is the KOS 6061-t6 extruded Aluminium deck, integrated headtube at 82.5 degrees and a fully sealed headset. All finished off with Nylon brake System, Nylon front plate and rear inserts.